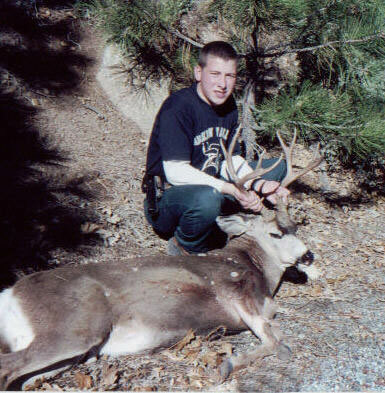 My son Dale drew a junior hunt tag near Yosemite Park. We had to work very hard as this hunt requires bad weather to push the deer out of the park, and we did not receive the hoped-for storm. On the last day of the hunt, when we were just about to give up, this nice buck appeared and my son harvested his first buck, a great four-point. I'm now preparing my daughter for her hunter safety course as she now looks forward to her first hunt.